Why the Maoist Strike Failed | United We Blog! Maoists have been at the forefront of using the word People as if they alone, and no other political force, is fighting for the people. Everything they do — from organising protests to looting grains to waging a war — is in the name of people, with the word prefixed in all their activities (People’s action) and expectations (People’s constitution). I talked to one of those ‘people’ who was brought in to Kathmandu to take part in the agitation. He wasn’t interested in replacing Madhav Kumar Nepal with Pushpa Kamal Dahal in Singhadarbar, he had no desire to establish civilian supremacy. These are not the issues that, I felt after talking to him, people in village can identify themselves with. All he wanted was an environment where he and his folks at Bhunji village of Ramechhap district could make a decent living (coincidentally I hail from a nearby village of the same district). He dismissed my question with such a facial expression that it didn’t take me long to understand it wasn’t his wish to come to Kathmandu this time. “There’s no peace in village,” he repeated. “There is intimidation.” He didn’t name the intimidators. And I didn’t insist upon it. “Shantisanga bachna paiyos,” he said. [We wish to live peacefully.] “Yes, peace,” repeated other folks around him from same village. “Road is the most important thing for us after peace,” said another man, Man Bahadur Shrestha, 54. Had the Maoists wanted, I feel, they could have started, at least, quite a few road and electricity projects during their months at the helm of the government. But they were no different from other political parties in that they too encouraged nepotism, favouritism and corruption. Several Maoist leaders have become millionaires since 2006. They are involved in not just extortion and forced donation drives but also in legitimate businesses in illegitimate ways. They are into, among other things, land brokering business making unnatural profits. People like Tilak and his folks have no idea about all these activities. Some people brought in to Kathmandu by Maoists were strictly under their supervision which made free-flowing interview with them impossible. A 19-year-old “YCL cadre” who agreed for interview quickly excused himself from a reporter saying he would first “consult with commander comrade.” He never came back. 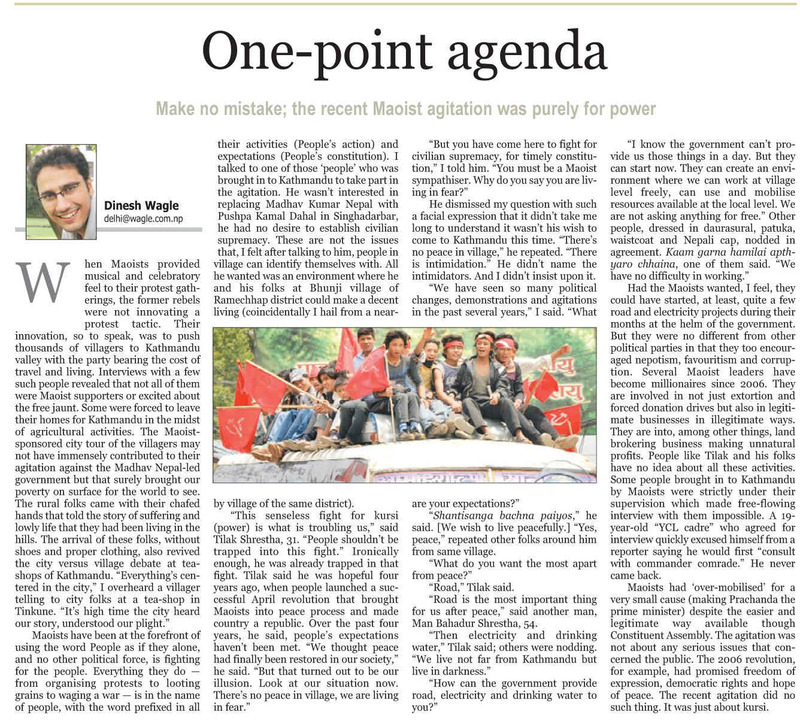 Maoists had ‘over-mobilised’ for a very small cause (making Prachanda the prime minister) despite the easier and legitimate way available though Constituent Assembly. The agitation was not about any serious issues that concerned the public. The 2006 revolution, for example, had promised freedom of expression, democratic rights and hope of peace. The recent agitation did no such thing. It was just about kursi. Absolutely. Dinesh dai, you have summarized the totality of present situation in a very fair and accurate manner. You never cease to impress your readers ! This is an interesting and well-written blog. I am in the USA and it helps me to gain insight into Nepal and its politics. Thanks! Read it…in scientific summarization Maoist movement creates Heat and Energy but failed to provide Light which is the essential factor to pursuate the life for the normal people. I’m thankful for your article Dinesh. Press in Germany is not telling anything about the status quo in Nepal. Now i’ve got a better understanding of the current situation. This time we all felt suffocated I think people underestimate the effects of violence and traumatized people. I think many terai and other people have moved to Ktm all are ‘ imported’, when a bunch of ‘ maobadi’ terrorized saugi’ s I saw a nice grandmother pick up a small stone. The not terrorists had painted hair (1) and were just boys under 25. Now it all seems forgotten, but I would not be surprised a day comes anyone smelling of m badi will not be given money in the bank. At least you express your deception in what you believed, nobody going to tell me it is helping the poor to prohibit a poor mother to sell a packet if biscuits life is hard enoug thanks to the fighting. I did not hear the word SHANTI so many times on tv national radio in my life. Peace radio, peace restaurant, peace business. In the encyclopedia on peace culture we shall include this blog. Who are these leaders that send them all forced to get diarrhea and worse in capital? Ramro chha Dinesh dai. I am always so impatient to read your blog. It does not take wanna be to state the fact- it is well known what troubles not only the city folks but villagers as well- poverty in mind, in action, in writing damp squibs. Its the fodder for people who say and see it as a plight but are actually party to it in the first place. I vivdly remember back in Andolan 2- the neo elitist (Wagle, pahadi, dixits) were so vocal for all the wrong reason- vendatta. They are equally to be blamed for the state of the nation. Where peace is brokered by foreign powers, parties are happy with the status quo where as a common man from glitzy city to Gulariya are suffering from all fronts, this is not a case of you and me- its the whole nation. Only the talking heads benefits and as Prachands rightly said are identified. This time I wasnt much able to catch up with the maoist hadtaal. Couldn’t watch the news (though only nepal one is available on my dth), surf net and also couldnt call up someone in Nepal. But the day I watched Nepal One, Hari Bansha was addressing a huge gathering. That summed up the whole matter for me. And this article is the postmortem of so called “agitation”. keep up the good work dinesh dai. I hope you are attempting to venture out of the darkness that you are covered in and realise that maoists do not want a democracy – they want maoism – a one party communist dictatorial state with their Chairman Prachanda leading the show forever. Try and put your head out of the cloud you’ve been in since and maybe before the signing of the 12 point agreement – an agreement to make use of useful idiots like yourself. Nice and well said..Leaders in Nepal are actually doing pity politics and they are hungry for power only. who saays the maoist strike has failed? do you remember when king gyanendra saying “Red is the symbol “in Bangdung conference Jakarta , maoist declared one sided seize fire. so what do you think it resulted in , was it maoist weakness? no not at all king gyanendra could not gain international support due it it , actaually it showed that actually king gyanendra did not want peace he was only cheating that he wanted peace , the government was compelled to cease fire . the cease fire broke after royal nepal army killed 17 unarmed nepali maoist. that showed gyanandra inner evil, so Madhav kumar is going to be the next one…. From the early morning to late evening whenever i tune to different FM station and tv channels they keep on updating us with the latest political news, but still i don’t understand it. I wonder why did Prachanda resigned the post of PM when he was given and why is he asking for the same when he left it on his own will??? ( Nobody forced him, it was his decision) . Why all these humdrum?? People have their own life and they want nothing than peace. Gathering mass in the street and heating the roads with no long term vision is I think one of the reason of the failure of the Maoist Strike… Opportunity knocks the door once, not always, when it once knocked Prachanda failed it, now the other should be given the chance… NOT AGAIN PRACHANDA!!!! We believe this event has ushered in a new era of awareness and a very clear signal that we have had enough. Amazing to know that it took so many years for the masses to rise up and express on what they believe should be done for them, for the country. Going forward, we are filled with cautious hope that now that people have voiced it, the recklessness with with the country is being run will begin its decay and imminent downfall. Aftermath feels the strike was sucessful, propaganda wars are like this, somehow you end up with compassion for those that had to get gastric flue in Kathmandu. I always get influenced by friends. I hate violence, football and bandhas I am also not in favour of Jihad, but humanity is one. What is the bickering all about? We are all going to die, be it NC or followers of Dr. Hisilas. Apart from wish for power just to help poor people nonetheless they parlty missed the point, the poor people got sick and miserable, and other poor people could not sell a packet of biscuits four minutes after 8. On the long run Nepal is to be independent of anybody and do not use international just when you need cash. They should all rid of the neurotic intransparent rethorics. I feel Bhattarai is awar of his mistakes, but is anyone else?